Cubanelle peppers are thriving in our garden this year. Also known as Italian frying peppers, these thin skinned peppers are sweet and great for stuffing, baking, grilling or eating raw in salads. They range in color from green to red and are tender and delicious. We make the stuffing with homemade sweet Italian sausage and cremini mushrooms. Cut the tops off the peppers and use the pepper flesh around the stem for the stuffing. Discard the stem. Slit the peppers 1/2-3/4th of the way to the bottom so there is room to hold the stuffing mixture. It does take a little time to make this dish. 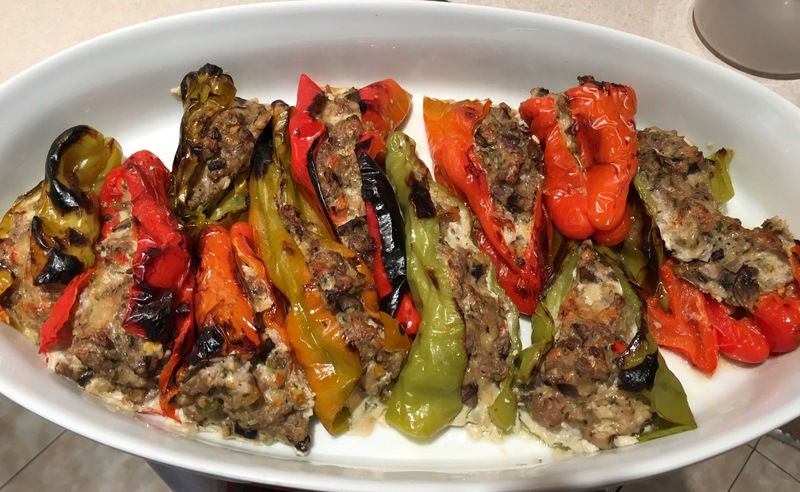 I find the easiest way to manage the task is to cut and stuff the peppers early in the day (you can make the stuffing mixture the day before), then cover and refrigerate until you are ready to put the peppers in the oven to bake. The stuffing is versatile. It not only works for peppers but as a filling for stuffed cabbage or escarole. It is also good for layering in lasagna or large shell-shaped pasta. Add homemade croutons and a bit of stock for a very good Thanksgiving dressing. Any leftover stuffing can be fried into a delicious sausage burger. Preheat oven to 375 degrees. Line a baking sheet with foil. Slice the tops off the peppers, reserving the flesh around the stem to finely chop for the filling. Slice peppers lengthwise 1/2-3/4 of the way down the pepper and remove the seeds and rib. 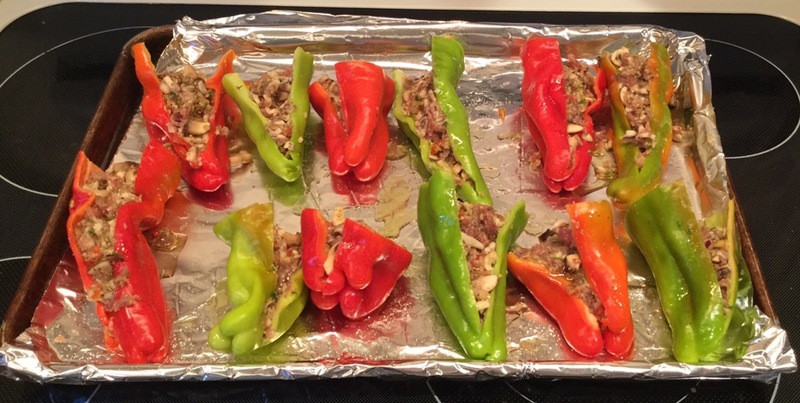 Place prepared peppers on the foil-lined baking sheet. In a large bowl combine all the stuffing ingredients and mix by hand until everything is evenly distributed. Stuff each pepper, but do not pack too tightly. Sprinkle the peppers with a bit of salt. Drizzle with a little extra virgin olive oil. Cover tightly with foil and bake 45-50 minutes until the peppers are fork tender and the filling is browned and cooked through. Remove top foil cover and brown lightly under the broiler just before you are ready to serve. Serves 6-8 as a side dish. This entry was posted in Appetizers, Pork, Thanksgiving, Vegetables. Bookmark the permalink.